In Japan, there was a concept called Honji-Suijaku. This concept explains that “Many Japanese traditional Gods and Goddesses are incarnations of Buddha. * Since Meiji era, Shinto and Buddhism are separated. 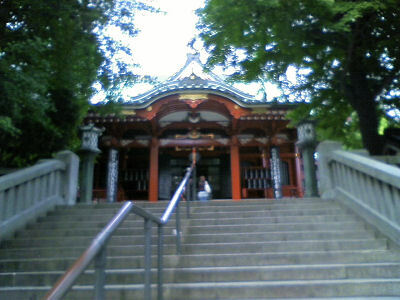 But many people visit both shrines and temples. 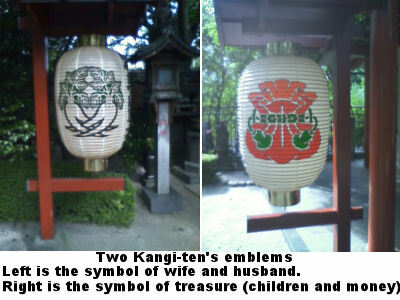 In this case, Buddhism icons are called Gongen in Japanese. 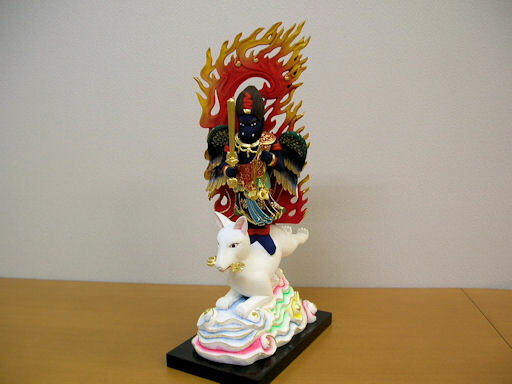 Gongen means “temporary manifestation by a Buddha (in order to save people) manifested form of Shinto deities” (incarnation of Japanese God). That’s ancient Japanese sapience to avoid religious conflicts between Shinto and Buddhism. 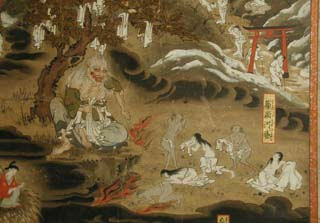 In fact, Jikkai Mandala of Nichiren Buddhism is including Japanese deities such as Amaterasu-Omikami from Japanese myth. About Gongen, Their figures have not regular style. Some styles exist depending on regions. Therefore, Japanese people can believe in both religions. 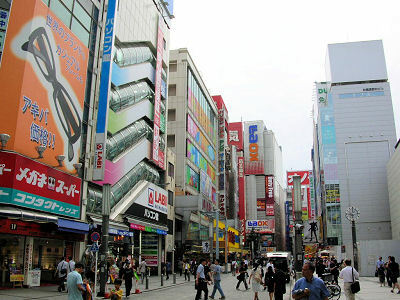 Akiba Gongen, Iizuna Gongen, Zaou Gongen, Konpira Gongen, Kumano Gongen, Sannoh Gongen (Hie), Atago Gongen and Hachiman Shin. Shinto is Japan origin religion. Shinto have no founder, no book like a sutra or a bible and no dogma. It’s just simple polytheism of nature worship. It says any deities dwell to any things. On the other hand, Buddhism have founder (Gautama Siddhartha), many sutras and dogma. 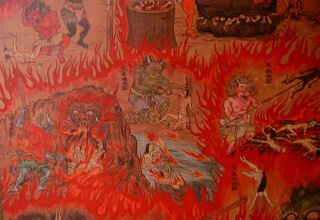 Honji-Suijaku thought is one of concept which unite both religions. Their main roles are to guard Buddhism teachings from evils. Here is a representative example of correspondence table between Buddhism and Shinto . Jodo school and Jodo Shinshu school are having different interpretation on the consideration of death and life. Basically, there are no six world in their ideas. There is only Jodo (Pure Land). After death in this world, go to Jodo and live again at Jodo. Buddhism teachings ask for spending self-restraining days to us. But nobody can do that (even monks). Which means nobody can get nirvana. Amida Nyorai (Amitabha) knows that. He had lead an ascetic life to take us to Jodo and to save us at Bodhisattva years. I mean, everybody can go to Jodo. “Namu Amida Butsu” is the words of thanks to Amida Nyorai (Not magic words, charm). In Jodo, we will be taught and practice asceticism under Amida Nyorai’s instruction. And we will be Buddha at there, the Buddha(s) will go back to this world to save people. This picture is called “Niga Byakudo (two rivers and white path)”. It’s popular story on Jodo School. Left side is flame river. It stands for anger and hatred. Right side is flooded river. It stands for desire and persistence. People (dead people) are walking on the narrow white path as resisting temptation. Shaka Nyorai (Gautama Siddhartha) calls out from behind “Don’t be afraid, I watch over you”. Amida Nyorai (Amitabha) calls out from front “Come on!, I surely save you”. Thus, everyone can go to Jodo. 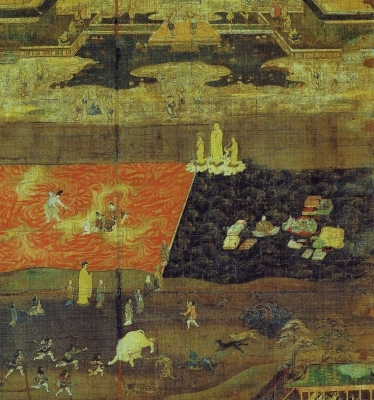 Anyway, there is no ghost and ghostlike thing in Buddhism teaching. The main current religions of Japan are Shinto and Buddhism. 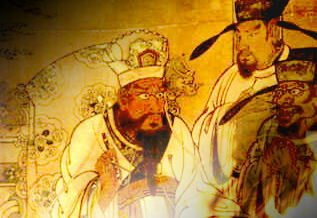 Both religions have long history, almost parts of thought have been mixed. Some years ago, the movie, “Departures” won the Academy Award for Best Foreign Language Film. This film expressed Japanese consideration of death and life. Approx. 90% of Japanese are Buddhist. 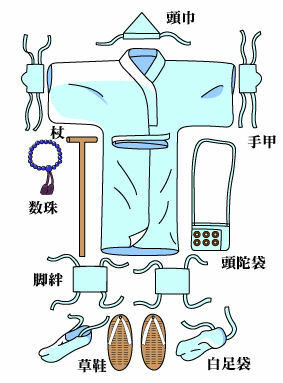 In Japanese Buddhism, the bereaved family give the white clothes to dead person and give Rokumonsen. 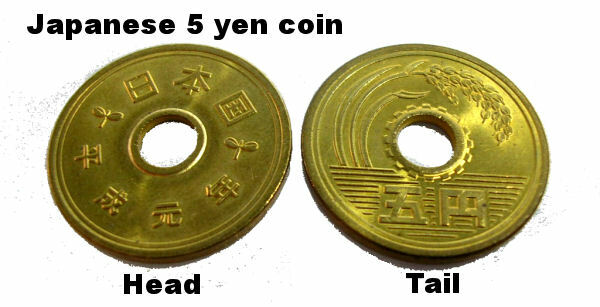 (white clothes is called Shinishozoku which means clothes for dead person, Rokumonsen means six coins). And it make him/her put into coffin, and cremate it. This costume is traveler’s in Edo period. white version is for dead person only. Dead person travels from this world to the world after death. 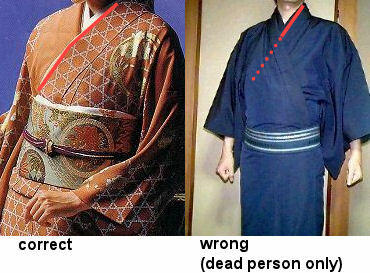 Attention when you put KIMONO on. Don’t wear left side cloth on your body. It’s called HIDARIMAE, this way of wear is dead person only. There is Sanzu river that flows at border between this world and the world after death. Dead person goes across Sanzu river by ship. As it needs Rokumonsen to ride on the ship, dead person pays Rokumonsen at there. An old woman who is called Datsueba exists at riverbank, she takes the clothes instead of Rokumonsen from dead person who has not the coins. 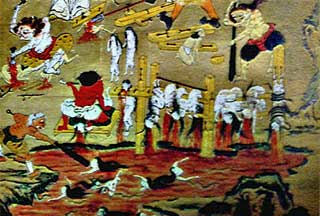 After crossing the river, dead person is put on trial by Enma Daioh at seven times every seven days. Enma Daioh judges based on Enma-Cho (Enma’s note) that is writing all actions of dead person. About Rikudo (six world) that Enma Daioh gives to dead person. 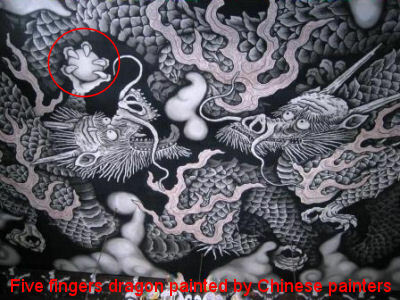 Dragon (snake shape) is imaginary animal in East Asia. 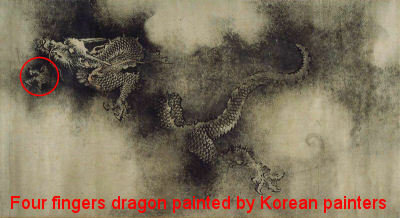 Dragon was the symbol of Chinese Emperor, it never allowed using this design by others including nations around China. That is to say, China was the center for all things. Accordingly, the Emperors of nations around China were sensitive to this, they settled that reducing the number of claws. China : five claws (five fingers). Korea : four claws (four fingers). 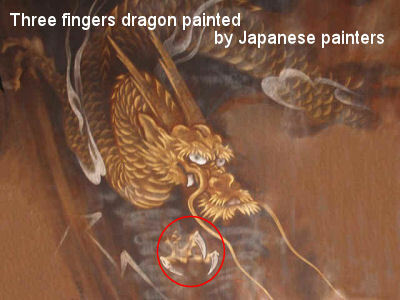 Japan : three claws (three fingers). As Hinduism and Buddhism were born in India, a part of idols are objects of belief by both believers. Following image is one of them. 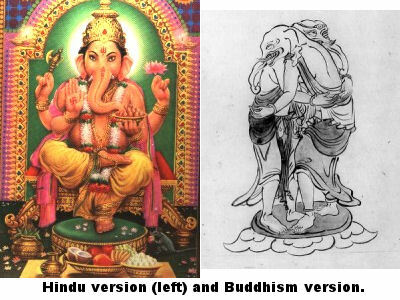 It’s called Ganesha by Hinduism. Or it’s called Kangi-Ten by Buddhism. I went to Matsuchiyama Shoden temple. In Buddhism, he is the symbol of happy married life, blessed with children, well-being of one’s family and a brisk business. His emblem is the crossed two radishes like a thigh shape. But wishing having children is important problem as wife and husband. As a result, they will be blessed with children and well-being of their family. If they had wonderful life, they would work hard (a brisk business). For that reason, he is the sign (symbol) of happiness. But, as his character is a little sexual one, almost temples are not opening him to the public. By the way, there is special sweets for Kangi-ten. It’s called Seijoh-Kangi-Dan. 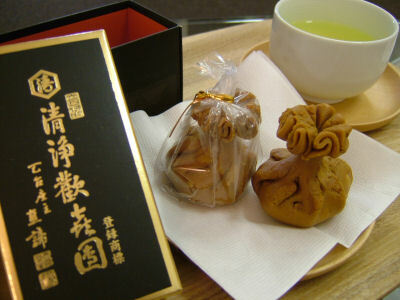 It’s the oldest sweets in Japan. The only one Japanese sweets shop is making this sweets in Kyoto!! I’ve ever eaten this. It’s good taste!